My ingenious body has succeeded in lulling me into a false sense of security. Having enjoyed really great feeling runs lately, today I sprang onto the treadmill expecting great things and **BANG** my little fluffy cloud disappeared. I had bought some new running stuff the day before, tees and shorts and some compression socks. The label said “running” compression socks so I thought I’d try them. I set off doing Jeff Galloway’s training, a 25 minute run. For a start I had everything, the TM and the app, set slightly too fast and I felt that I just couldn’t keep up, so I slowed it down a little. I was still running at 11.2 kph. It was a bad start to the run because I just felt I’d run off too fast and that just kills me. I have to ease into running! Then after maybe half a k my thighs started to tighten up. It felt as if they weighed a ton and I was really starting to struggle. Not long after my calves tightened too and I was heading into shin splint territory again! Not phased, I tried to look at it logically. I ran fine on Monday. What was different? The treadmill for one, but previous runs on the treadmill had been fine. That only left the gear I was wearing and more specifically the socks!! I rolled them down and tried again. Instant relief. I reckon the socks were recovery only (and wore them all night to prove it!) However, it was already too late. I was tired; the damage had been done. I was hoping to get a bit closer to 5k than I did. The app told me I’d covered 4.66k in 31 minutes. My treadmill told me I’d done 5.2k in 34 mins, but that included 6 minutes of warm up/cool down. Meh. Whatever I did, I know I won’t be wearing those socks again until after my run! …it has been many days since my last confession. Sometimes life gets in the way of the internet! That’s a good thing, by the way; I spend far too long online. This last weekend I spent away from home with my adoring and adorable husband looking at parts for his classic Jaguar and really enjoyed myself. I did think about taking my running gear, but didn’t and the time I did try to run in the event grounds, my trews* started to fall down! I’ve not been missing runs though. I’ve been following the Jeff Galloway training app and today I’m on for the start of week 2. I’m finding it great to follow and my times are getting faster each time I go out and the best thing is I don’t seem to be putting a great deal of extra effort in to get faster times. I feel really strong at the moment and I’m running consistently fast laps. The app’s music is great for running to, not the best tunes – I think I could chuck something together in GarageBand that would be better – but the beat is strong and I easily run to it. My last run out was just over 6k through the woods behind where we live. The tracks are OK, not trails as such, but fine for running on if you have the time to watch where you’re putting your feet. Some tracks are full of loose stones, other are thick with mud. It’s a great strengthening surface. The route also has some short, sharp hills as well as some steadier climbs. A nice bit of everything. Last time I was out here the route was extremely muddy as the woods are being worked. Trucks and machinery are chewing the softer tracks up badly and, if it rains, it turns into a quagmire. Luckily on Monday evening it was dry and it hadn’t rained for days, maybe weeks. I set off with Murphy, my Jack Russell Terrier, running into the warm evening sunshine. One of the reasons I like running through the woods is that Murphy can run with me without having to worry about him. I really don’t like running with him on the lead as it pulls my shoulder out of alignment. He might be a little dog, but he’s a toughie! He’s free to stop and sniff and catch me up and eventually he just runs alongside me. That is wonderful! Jeff told me to run a 3:1 ratio. I’d been running a 4:1, but decided I’d try the 3:1 and just see what difference it made. He said this would be an easy run, below my normal pace but longer than 5k for endurance training. I ran happy the whole way, unconcerned about my pace because it was being dictated via a tune! I had no issues with being able to keep up the pace from run one through to the last one. With the surface and route in mind, I was really surprised later when I worked out my pace. I covered 6.2k in 42 minutes, but that included a warm up walk of 3 minutes and a cool down walk of 3 minutes. If I walked about half a kilometre at the start and the end, I must have run 5.8k in about 36 minutes. My pace was about 6 min kilometres. That’s pretty good for what definitely felt like a steady run on a less than forgiving surface. I’m impressed! Today it’s very wet and running through the woods isn’t an option during the day as the machines will get me! So I need to check what Mr Galloway has in store for me and report back later! Today I tested out the new Jeff Galloway Ultimate 5k app for iPhones. I’ve tried a lot of different training programs – I used the Couch to 5k to get me running and then moved up to the Bridge to 10k when I was wanting to up my distance. To be honest I found the step up to 10k painful until I started using Jeff’s Run-Walk-Run system so using an app he’d been involved with developing seemed a good thing for me to do. The app looks good; it comes with a shed load of free music that is beat-synched to the pace you are trying to achieve. It can be used on the treadmill or has GPS so it can be used outside. I tested it on the treadmill this evening. To begin with I had the speed up too high and didn’t realise I could turn it down. Once I’d sorted that, I was actually turning the speed up as I went. The app automatically adjusted the pace and the music to suit. It informed me on the main screen what speed to set the treadmill to and as soon as I did I could hear the beat being spot on. Clever stuff! I got regular updates on the time remaining and general motivational comments from the big man himself. There is a couch to 5k programme, which I ignored of course, and an improve your 5k time programme. I chose that and had a sneaky look at what was coming. The runs move from short, easy ones to longer, harder ones and speed sessions. I did a 20 minute run today and was told to have tomorrow off and that I was up for a speed session next time. At the end of the run I got a synopsis of how I’d got on, which was pretty good. I cracked the 6 minute kilometre for the first time. So far the app gets a big thumbs up from me. My goal, on starting running last year, was to sub 30 minutes for the 5k I was training up for. 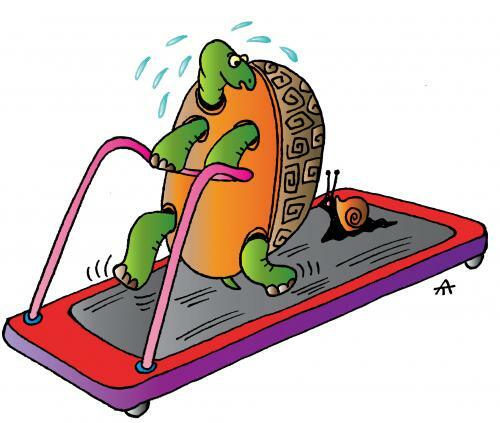 I managed that on the treadmill last year for the Mad Mary Super Series, but have still to do it on the road. I’m getting close though! Last week I managed 31 minutes and was really pleased about that. I’m sure that if I ran on a level course, instead of even the gentle hills I do run on, I could easily sub the 30 minute mark. I’m still following the Galloway 4:1 (mostly, I ignored it at the end and went for a sprint finish instead) and after each walk at 5 kph, hit the 9kph button and cranked it up by 1kph on each minute marker. As I’d started cautiously by jogging for the first half km my time came in around 30 minutes. I’m not sure exactly because at 15 minutes in I hit the stop button instead of the increase speed button…again!! I did have my iPhone clocking the time, but I know I started it before I started running and stopped it after I’d slowed to a walk. It showed 30:34, so I’m guessing I did sub 30 minutes in actuality. I suppose it doesn’t really matter. I can see myself getting faster and it matters more for me to achieve my target on the road than on the treadmill. At last, sunshine!! It’s still quite cold here, but the sun sort of makes it feel warmer even if it’s not so I set off this morning for a sunny run down the shore road. Apart from one really poor section of road where the camber is so bad you really need to run along the white line, the shore road is pretty good; some parts have even been recently resurfaced. It dips down off the main road and steadily climbs to sea level. It’s one of those roads that appears to be always climbing no matter which way you hit it! When I set off it was just above freezing, but, having learned my lesson from the other day, I set off in a long sleeve top, running shorts and a baseball cap. It didn’t take long to warm up and I felt comfortable when I did. I had hoped for a 30 minute 5k, but hit it at 34 minutes, still 4 minutes faster than my last 5k on this route a month ago. I think on a flat course I could easily sub 30 minutes now; running the gentle hills of this route can only help me! That’s three days of consecutive running now – can I maintain this tomorrow?? I was feeling a bit achy after Wednesday’s long run, sometimes it takes me a few steps to get upright and walking properly after sitting, so I decided the best thing was to have another run to loosen things off! Kill or cure. I didn’t have long in between finishing painting and getting ready for a pint of Guinness in the pub to celebrate St. Patrick’s Day, so I chose my session carefully and opted for a 20 minute speed session on the treadmill. This is the one I’d done before and enjoyed because I could feel it working me. The fast changes in speed over the 20 minutes takes some concentration as well as deft finger work on the controls. My biggest problem though is seeing the red digital display when it’s light outside. The program is a double pyramid, with 1 minute intervals steadily increasing and decreasing, followed by faster 30 second intervals with a jog in between each pyramid. Coupled with a 5 minute warm up and cool down walk the programme takes 30 minutes. It’s a nice workout. I covered 3km in 20 minutes which gave me 6:40 pace. Considering a few minutes were jogged at 6 and 7 kph I think that’s pretty good. I wouldn’t normally run that slow, even cooling down, but I’m definitely less achy now (that could be down to the wondrous medicinal qualities of a pint of Guinness) and I’m looking forward to a tempo 5k later. I’ve neglected my road running a bit lately for many reasons so today, I decided, was the day for getting ‘out there’. I used a route I like because it’s quiet. I usually only see one or two vehicles and so I don’t have to worry about jumping into the ditch when a car comes flying towards me! It was cold when I started out, the thermometer was showing 2ºC, so I went out with my nice new Ron Hill hat, a long sleeved top, tights and gloves. Great! Hmmm, great until the sun burned through the mist that was keeping the temperatures down. Suddenly it was almost tropical out there! The route is a mixture of long steady inclines and fast descents with one hard hill at the end. Previously I’d struggled with that last hill and started to dread it. I stuck to my Galloway 4:1 principles and soon I was running a faster pace than I had last time on the same route. Runmeter told me at 1km that I was 3 minutes ahead of schedule. By the time I reached 5km, at 31 minutes, I was 7 minutes ahead. I may have been running a bit fast by 5km, but I felt strong so I pushed on. Unfortunately the road was flooded at one point and even though I tried to keep to the grass verge, that was sodden too. Result, two soggy Asics and I hadn’t even hit 5k. I hate wet feet! My socks must be pretty good though because no sooner did I feel the water hit, the sensation disappeared. I’m pretty proud of hitting my 5k at 31 minutes with having to slow for the water hazard. 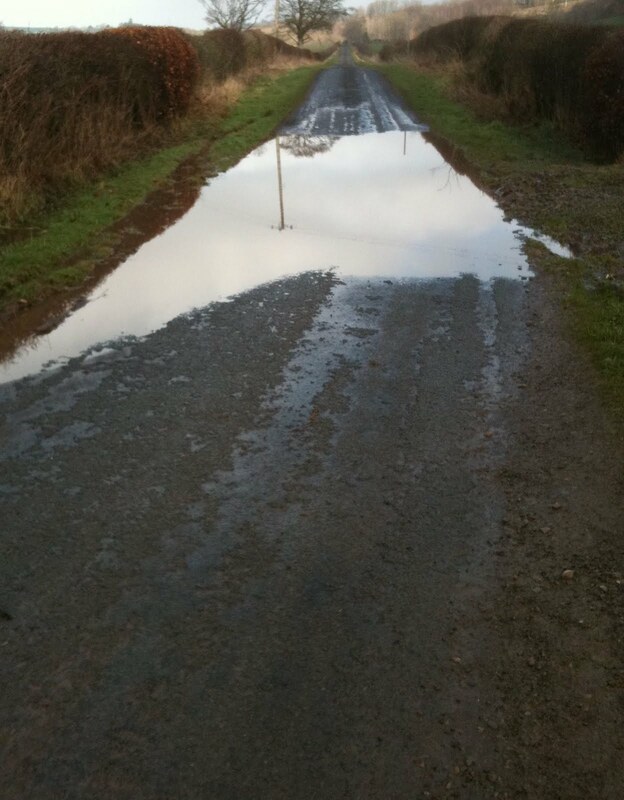 It was almost like adding a steeplechase to my route! Then at 6k a ewe sprang at me from the grass verge, evidently it had escaped from the neighbouring field; it half scared me to death! As Monty Python might say – I wasn’t expecting a sheep, no one expects a sheep! As I hit the last hill I just kept going. I felt strong and the hill I once dreaded was nothing to me. I slowed down, yes – it’s a hill, but not by much and I didn’t stop. My route took me away from my village and looped back again after 5 miles. I knew I was going to have to add a little more on to get close to my 10k target so I chose to run through the village, past my house and down the castle road. The castle road was where I started running a year ago. I misjudged the distance a bit and turned back too soon, falling short of my 10k by just over half a km. Rather than run up and down until I heard the magic 10k click through, I decided 9.33km was close enough.